Zoning for the first phase of single family detached and attached areas in Boulevard One was approved by Denver City Council in August. Single family homebuilders may start construction late this year. Prospective homebuyers should contact builders directly. Please visit www.jhfdesigntest.com/bolv1 for details. Improvements to First Avenue will begin in early November. Overhead utilities on the south side of First Avenue will be removed, and new utilities buried. The south side of First Avenue will be improved, with a new sidewalk, street trees and a bicycle lane. Traffic flow will be maintained during this work. The Lowry Redevelopment Authority has submitted an application for zoning the Community Park-Mixed Use Center at Boulevard One. The application, for C-MX-5 zoning, is posted here. This district allows for residential, retail, entertainment and civic uses, along with offices, in the area north of Lowry Boulevard, west of Quebec Street and south of First Avenue. Parking for the Schlessman Family Library will also be accommodated, and apartments are planned for the area between Quebec Street, Archer Place, South Pontiac Street and Lowry Boulevard. 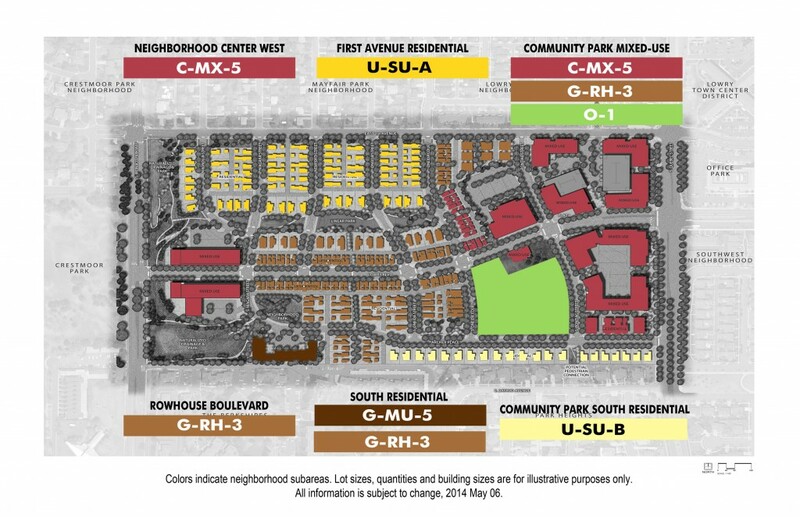 Parking ratios at Boulevard One will be managed through the Community Design Guidelines. The Boulevard One plan is the result of more than 60 public meetings since 2006, resulting in more than 50 modifications to the early redevelopment plan and final General Development Plan. – Less density (1,200 residential units to 800 units). The result is a medium density area consistent with the Lowry Town Center and surrounding residential and office uses. – Building heights staggered from a maximum 2.5 stories on some edge streets to a maximum of 5 stories within the district. – Building setbacks on parts of First Avenue and Monaco Parkway. – Minimum parking requirements consistent with the old zoning code, managed by the Boulevard One Design Review Committee. For more information about Boulevard One, visit www.jhfdesigntest.com/bolv1.